World in Motion: When Heroes Go Hungry! Welcome back! It's a new week of great ads for us to showcase to your delight... I hope you all had a great weekend and are ready to be entertained! 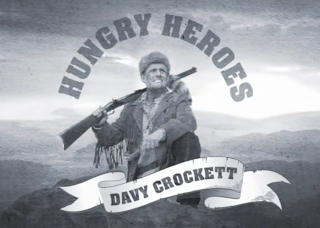 I'll start the week off with this witty ad featuring none other than a hungry Davvy Crockett venturing around the U.S. in search of the HungryMan CEO! Check it out below! Featured in this ad is Mike Holmes, a longstanding comedian known for his sharp jokes and banter. Despite its length I believe this ad captures one's attention nicely and keeps you strumming along with Holmes great humor. HungryMan is also featuring other hilarious ads like this one but starring Genghis Khan and Leonardo DaVinci - stay tuned for more updates!